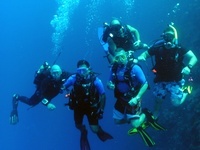 With over 24 years of scuba diving experience, we can help both novice and experienced divers alike. We are committed to providing each and every student with personalized attention at competitive prices. Our entire staff is made up of dedicated scuba diving professionals who put student safety first and ensure that students are comfortable and proficient in their skills before advancing. We look forward to helping you learn and perfect the skill of diving for a lifetime of adventure.